President of the Foundation for Science Technology and Civilisation (FSTC) gave a speech at IGMG's ISVDAY(UniDay) in VHS Meidling, Vienna, Austria. Two years after Professor Al-Hassani's visit to the German IGMG's UniDay in Bielefeld which attracted 3,500 attendees, Austrian IGMG invited Professor Al-Hassani to Vienna to give another speech to their gradutes. President of the Foundation for Science Technology and Civilisation (FSTC) gave a speech at IGMG's ISVDAY(UniDay) in VHS Meidling, Vienna, Austria. Two years after Professor Al-Hassani's visit to the German IGMG's UniDay in Bielefeld which attracted 3,500 attendees, Austrian IGMG invited Professor Al-Hassani to Vienna to give another speech to their gradutes. 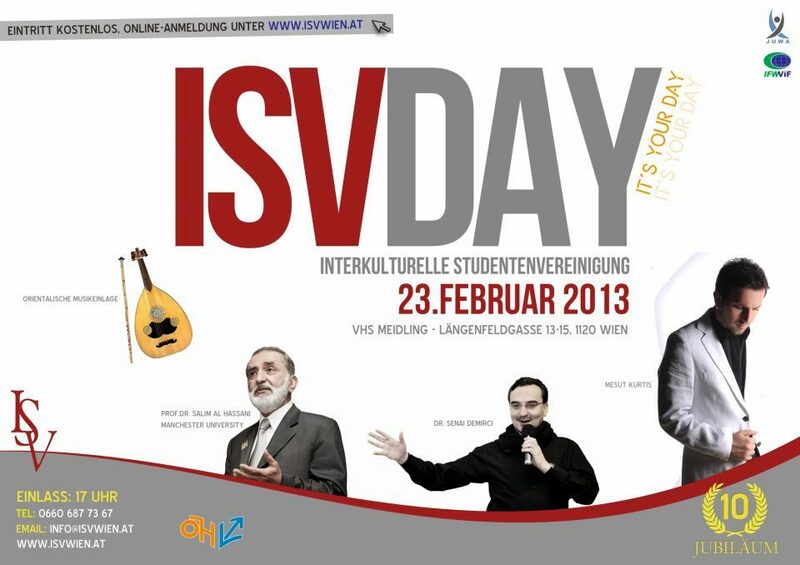 On February 23, 2013, the Inter-cultural Student Association organized the ISVDAY in Vienna, which 600 guests attended. The event gained more in value since it was also a celebration of the 10th anniversary of the ISV at the same time. The programme was followed by the media and gave the participants an unforgettable evening. The start of the first part of the event was a Quran recitation given by Abdulkadir Öz. 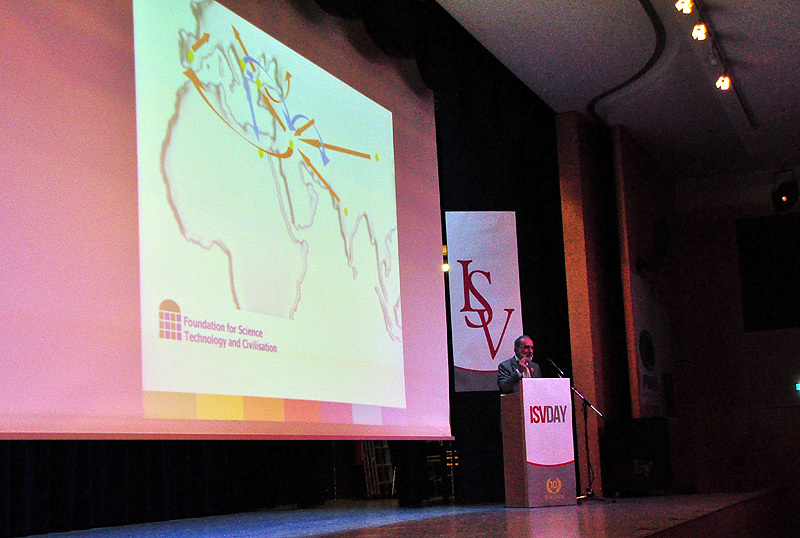 Then the chairman of the ISV, Fatih Vural, delivered the opening speech. He pointed out that the current generation has to think about what contributions the aspiring young Muslim academics can give in the Europe of tomorrow. "Students are the future of this society," said the chairman of the ISV. Finally, Vural pointed out the importance of the unity and cooperation of Muslim students. He was followed by Mr. Mehmet Turhan, President of the IGGiÖ, Dr. Fuat Sanac and chairman of IGMG students' department Taner Dogan . All emphasised the importance of unity, good conduct and perform charitable acts. A special highlight of the evening was the assembling of all the former chairmen of ISV who were given appreciation Awards. Then the Vuslat band gave an oriental music performance which entertained the enthusiastic audience. The Keynote speech of the event was by Professor Salim Al-Hassani from the University of Manchester and President of FSTC. The title of his presentation was 1001inventions: Best of the Past to build a Better Future. 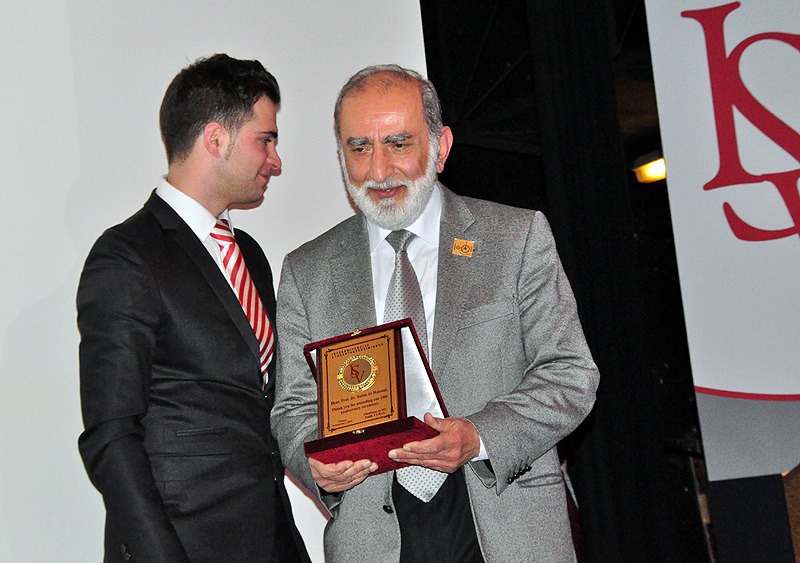 It was attended by 650 persons, mainly Austrian born Muslim university students. In the lecture, Professor Al-Hassani identified gaps in the syllabuses of science, technology, engineering and maths subjects where mainly Western are recognised. The impact of this 1000 years amnesia on social cohesion and inter-cultural relations is negative. It creates a superiority complex amongst Europeans and at the sometime it generates a feeling of inferiority complex amongst the youth of non-European people. This gap is dangerous as it breeds extremist behavior. The identity of individuals is vested in their past. The past is what an individual acquires from parents, schools, media, etc. When people become aware of the contributions of their ancestors, they acquire feeling of dignity. The presentation lasted 40 minutes. It reviewed major scientific discoveries during the so called "Dark Ages", showing numerous examples of men and women of various faiths who lived in the Muslim World, worked together and made significant inventions in all walks of life that still affect our present life. Those role models were driven by incentives for building a better future for humankind. Many of the ideas were inspired by their faith and encourages by the society and occasionally by wise leadership. Women like Fatima Al-Fihri is an excellent role model for young ladies. She was builder of a centre of learning in Fez, Morocco, which became the oldest university that is still functioning to the present day. Education was prime in early Muslim civilisation. Inclusivity of all faiths and justice to all was a dominant feature for centuries. Young people of today should take wisdom from those great role models who aspired to demonstrate their faith through beneficial deeds to the society in which they lived and to humanity at large. The big challenge at hand is to use the best of the past to build a better future. After the lecture, the guests had a 30-minutes break and enjoyed a refreshing buffet. The second part of the event was continued with the opening speech of a Government representative, Officer of the "Österreichischen Integrationfonds" who emphasized the importance of working together and being part of the Austrian society. Then the international secretary of the Student Union Community Action Group, Florian Weinberger addressed the difficult issues and problems which students encounter during their studies. He especially emphasized the need for cooperation between the AG and ISV. The renowned Turkish author and radio host, Dr. Senai Demirci gave a spiritual message on the need to understand the Quran. He was followed by an excellent performance by the international singer Mesut Kurtis.